By Costa Maragos Posted: March 10, 2017 10:00 a.m.
Bruce Walsh is in esteemed company. He’s one of eleven highly accomplished Canadians named a mentor by the 2017 Pierre Elliott Trudeau Foundation. 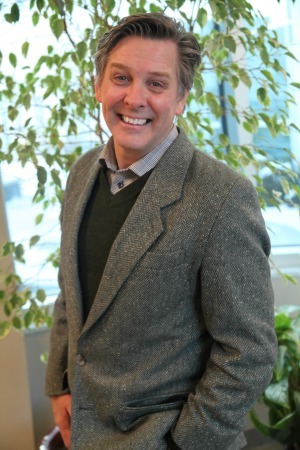 Walsh is director of the University’s successful publishing house, U of R Press. As a mentor, Walsh will be paired with promising doctoral students known collectively as Trudeau Scholars. The mentors will share their knowledge with the students in the social sciences and humanities. Walsh will mentor two doctoral students. They are Bailey Gerrits, PhD in political studies at Queen’s University and Jennifer Jones, PhD in geography at the University of Guelph. U of R Press was launched in 2013 under Walsh’s leadership. Since then it has produced six national bestsellers, two of which are scholarly titles, a rarity in academic publishing. This month, one of its best sellers, “The Education of Augie Merasty – A Residential School Memoir” was chosen for the inaugural One Book One Province Saskatchewan Project. The initiative, launched by the Saskatchewan Library Association, encourages everybody in Saskatchewan to read the book. The Pierre Elliott Trudeau Foundation is an independent and nonpartisan charity established in 2001 as a living memorial to the former prime minister, by his family, friends, and colleagues. Thomas Cromwell, retired Justice of the Supreme Court of Canada. He currently serves as chair of the Action Committee on Access to Justice in Civil and Family matters. Valerie Pringle, prominent broadcast journalist who now works as a volunteer board member and fundraiser for the Trans Canada Trail and the Centre for Addiction and Mental Health in Toronto. Barbara Doran, filmmaker, activist and businesswoman considered a pioneer in filmmaking in Newfoundland and Labrador. Mel Cappe, professor at the University of Toronto and former clerk of the Privy Council, secretary to Cabinet, deputy minister, and former president of the institute for Research on Public Policy. Lynn Smith, former British Columbia Supreme Court judge and executive director of the National Judicial Institute. Please visit here for the full list of mentors.